Hello and welcome back to the links of the month. The last time I have introduced you to some enhancements to Windows Azure. I thought March was a big month for Windows Azure, but … what was April for an amazing month! We had the AzureConf the Windows Azure Global Bootcmap last week and some awesome enhancements to Windows Azure. Some of them will be covered in this article. Windows Azure: Active Directory Release, New Backup Service + Web Site Monitoring and Log Improvements – Announcement #1 of the month. Windows Azure: General Availability of Infrastructure as a Service (IaaS) – Announcement #2 and the biggest one. 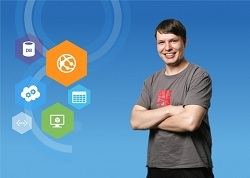 Scott Guthrie gives an introduction to the awesome capabilities of Windows Azure. Announcing the release of Windows Azure SDK 2.0 for .NET – Announcement #4 was just made today and should the most interesting one for .NET developers. In-App Purchase and Mobile Services – An awesome post made by Josh Twist how you can implement in-app purchases on iOS in combination with the Windows Azure Mobile Services. Fetching Windows Azure Mobile Services Data in XAML based Windows Store Application – A simple example how to fetch data from the Windows Azure Mobile Services from Windows Store applications. More Dev Center features – we’re listening – Announcement of some improvements to the dev center, f.e. the ability to cancel submission and automatic screenshot resizing. Visual Studio 2012 Update 2 Now Available – The announcement of update #2 for Visual Studio 2012. Json.NET 5.0 Release 1 – Another announcement. Not for a Microsoft product, but for a library most developers are using. Like you have seen, a lot of announcements in April. Let’s wait and see what will be going on in May. This entry was posted in English, Links of the month and tagged ASP.NET MVC, Global Windows Azure Bootcamp, Infrastructure as a Service, Json.NET, Links of the month, MVVM, MVVM Light, Visual Studio 2012, Windows 8, Windows Azure, Windows Azure Mobile Services, Windows Azure SQL Database, Windows Azure Virtual Machines, Windows Azure Web Site, Windows Phone on May 1, 2013 by Jan Hentschel.